There are moments in Trials Rising when your stomach rises up into your chest, you can feel the pull of gravity through your TV screen, and the bike hangs in the air for the briefest of seconds like a roller coaster at the peak of the tracks before plummeting back to earth. The Trials series has always excelled at these pulse-pounding moments. Despite the fact that you’re playing a sidescroller—rarely considered an especially immersive genre—you genuinely feel like you’re there. You feel like you’re experiencing the course alongside your avatar. In fact, this feeling is frequently intensified by Trials Rising’s core mechanics. Twitching a smidge too far in any direction could result in your character exploding into a million little Fox-sponsored pieces. Across a slew of games, developer RedLynx has mined the series’ Keep It Simple Stupid controls—R2 to accelerate, L2 to brake, left stick to lean—for exhilarating moments of tension facilitated by tightly designed levels. The latest title in the long-running motorbiking series continues to nail these basics. Trials Rising feels consistently good to play across a slew of levels that test your skills on a very neat difficulty curve. But I’m continually impressed by how the series’ camerawork solves a multitude of potential issues that 2.5D games often face. Trials Rising’s camera placement is nothing new. 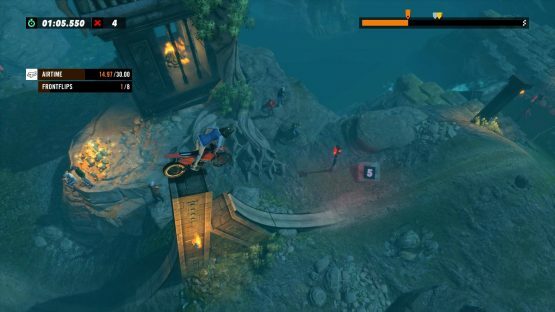 Like Trials Fusion— the most recent mainline game in the series—Rising maintains control of the camera throughout each course. You can’t move the right stick around for a better look at the level. You always see exactly what RedLynx wants you to see. Though we typically reserve the term for big budget, story-focused action games like The Last of Us, Uncharted or God of War, the Trials series’ tightly controlled perspective is thrillingly cinematic. When you crest a large hill, the camera often moves behind your rider’s shoulder, providing the most stomach-churning view possible for the ride down. When you launch off a ramp for massive air, the perspective may zoom out, allowing you to take stock of just how impressive your aerial feat really was. 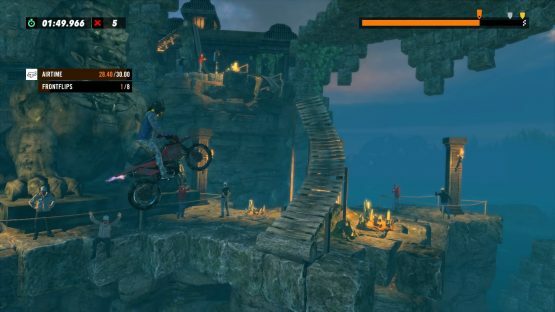 Given that each level in Trials Rising takes its theme from a real world location, the camera angles are frequently set up to show off the jaw-dropping vistas contained in almost every area. (This is especially appreciated now that the series abandoned the empty, brown and rust-colored warehouses that defined earlier games). It would be a shame to miss out on the gorgeous temples of Angkor Wat because I was moving the right thumb stick in the wrong direction. Just as importantly, the camera in Trials Rising fulfills a vital gameplay function. In 2018, I reviewed Steel Rats for PSLS. Like Trials Rising, it’s a 2.5D motorcycle game. Unlike Trials Rising, it sets its action on a three-tiered plane. Other platformers, like LittleBigPlanet, have used this approach in an attempt to expand the exploration space, hiding collectibles in the background or requiring the player to sidle up to the foreground to move around an obstacle. It also is a natural extension of putting 3D models in a 2D world; it seems like they should be able to move around more than their pixelated genre-mates. But in my experience, it never works very well, because shifting among the tiers is awkward at best and frustrating at worst. 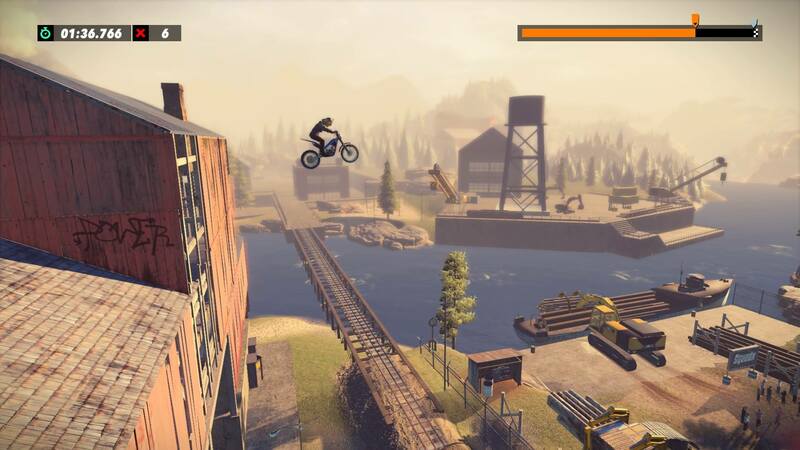 For a precision platformer like Trials Rising, it would be an infuriating approach. Trials Rising uses a different approach to make it feel like its 3D models are inhabiting a 3D world. Instead of offering this control to the player, Its camera shifts as players progress through the level. Sometimes, it moves behind you to give the impression that the track is snaking to the left, despite the fact that the bike is only ever moving along a 2D plane. It’s a smart fix, one that bridges the gap between 3D exploration and 2D precision. This is all accomplished through smart level design, yes. But, that level design sings—or, um, revs its engine—because of an impeccably placed camera. It isn’t a novel idea, but Trials Rising executes on this technique as well as I’ve seen. If its more obviously cinematic brethren succeed at making the player feel like an action star, Trials Rising does a great job of making the player feel like they’re an athlete in a RedBull or Dude Perfect video, traveling to tropical locales, and pulling off X-Treme stunts. That is a wild accomplishment for a 2D platformer.